If you’ve been around the studio lately, or streaming any of our newest rides, you might have noticed that Steven and Christine have been eliminating the arms sections in some of their rides. Sound nuts? Maybe not! Hear their reasons why you should switch up your ride routine and try the no-arms ride out for yourself! Steven: I use “no-arms rides” as a tool to allow someone to get stronger in a 45-minute time frame, and to push harder without the recovery of heart rate that arms allows. It keeps your heart rate up and allows more calorie burn as well as more strength building. I encourage people to work hard in an no-arms class, then maybe challenge themselves to get the same total burn in a class with an arms section. They will find themselves working harder, but will be stronger overall from the no-arms class. It’s also nice to just lose yourself in the music with your eyes closed, without interruption in the flow of the class with the arms movements. There are more variations in what roads we can ride, etc. Some people do weights and workout off the bike. Meaning the bike is their main source of cardio. People can get more out of the routine by lifting at the gym and doing all their cardio separately on the bike. A lot of outdoor cyclists find no-arms rides to their liking; more where they spend all their time focused on the inside experience as part of their outdoor training. They don’t do weights on the bike, and that’s ok–I have heard of and trained with many outdoor enthusiasts who are stronger outside because they train inside with the intervals offered in class. It translates well to their overall training. Christine: The benefit of doing no-arms is the added endurance. During arms series, most riders’ output drops dramatically. With arms sections lasting between 5 and 7 minutes, it is in effect taking a huge recovery in the third quarter of class. Riders will begin to see outputs that they have not yet seen by not doing arms. Have you taken one of Steven or Christine’s no-arms classes, and noticed a difference in your ride output? Let us know in the comments! How does this high-energy coach make every ride count? It’s all about warming up, recovering smart and staying fueled! Get on the Bike as Soon as You Can: Getting warmed up and riding before a ride begins will allow you to extend ride time, get your heart rate up, and burn more calories. Recover Only When You Need To: You’re going to have to recover, period, but you may find as you get stronger that you can skip a suggested recovery an instructor calls out. When an instructor says to recover, our bodies tend to react out of habit. But we should always be asking ourselves,“Do I need it?” Maybe you can hold a set interval five, 10, or 20 seconds longer after an instructor pulls you out of a push. Recover Without Sitting Up and Wiping Resistance Off: I used to sit up and wipe resistance off between every song when I started riding, and I see it happening often when I teach. But you should focus on creating new habits that will encourage you to get stronger: Put the same attention on your recovery as you do when you are pushing hard. I tell people to find a road where you can recover at a pace that allows you to drink water, towel off, and find your breath without sitting up. Always use the numbers… find that steep, slow climb or flat road short of a sprint. Take Multiple Classes: If you’re at home, take one 45-minute class, then stay loose and tack on another ride. You can stay for part of a longer ride, or hop on a 20- or 30-minute ride. Work on creating more endurance. If your body grows into riding for 90-minutes, just imagine how much stronger you will be in a 45-minute class. Have Recovery Rides: Depending how much you ride and what other activities you do, you should allow recovery workouts or a day off as part of your regular routine. If you find it hard to take a day off, then allow for a ride that’s light and fun, in which you don’t train to get the best “PR.” It will help your muscles and brain to recover. Maybe even spend more time in the saddle moving fast without climbing as much as your last ride. Or only come out of saddle enough to get your heart up, then work light resistance at a fast pace on a flat to small hill in saddle. This will allow a great calorie burn and plenty of sweat, while letting the muscles recover from that climb yesterday. Eat and Hydrate: Eat something like oatmeal or a carbohydrate an hour before a ride; it’ll give you energy for the workout. And drink lots of water to stay properly hydrated. (Find that you’re not sweating much? Your body is probably dehydrated!). Most importantly, maintain a healthy diet and drink plenty of water all day long–it’s important to fuel and refuel before and after a calorie burn. Add your own tips to maximizing every ride in the comments section! If you’ve ever felt fatigued or like you might not make it through a 60 or 75-minute ride you are not alone. Here are some great ways to fuel up that will help make sure you don’t feel drained of all your energy by the end of the ride. To Eat The world of healthy energy snacks has exploded over the past few years, to the point where sometimes it seems like there are too many options. Finding the right foods to eat before a ride can seem a little confusing. So, we’ve compiled high-energy snacking tips designed to get you through longer high-intensity rides! During an intense workout, your body provides energy mostly by burning carbohydrates, so you want to increase your intake of good carbohydrates before a long ride. Different carbohydrates take more or less time to digest depending on their glycemic index (GI). A few hours before your ride, try lower-GI foods like quinoa and pasta, or fruits like berries or peaches—these healthy snacks will slowly release energy throughout the day until right when you need it during your workout. Peloton Eats Head Coach Steven Little shared that his go-to meal before working out is a bowl of oatmeal, it keeps him energized and going strong. Fellow Head Coach Lisa Niren explained that her favorite go-to snack before working out is a banana because it is “nature’s Power Bar” packed full of digestible carbohydrates and potassium which helps maintain nerve and muscle function. Strapped for time? Try mid-to-high GI foods like bananas, raisins, pineapples—even sweet potatoes!—about 30 minutes before the workout to get your carbohydrates digesting faster. To Drink The most important part of any workout is staying hydrated, but it’s not just about water anymore. New sports and energy drinks are infused with quick-digesting carbohydrates and electrolytes to give you the boost you need to keep pedaling. Try to find one with 4-6% carbohydrates—just the right amount to keep you energized but not give you a sugar-crash. Sports drinks are also perfect for that mid-session boost to get you through the last leg of the ride! Peloton Drinks To keep up your stamina and help prevent light-headedness or dizziness during longer rides Head Coach Steph Neiman suggests putting a packet of Electro-Mix, a calorie and sugar free dietary supplement, in your water to give you that extra bit of energy. Steven prefers to sip on coconut water throughout his rides because it is loaded with potassium and absorbs fast giving you a quick boost of energy. During class Lisa always keeps a Vitamin Water Zero packed full of electrolytes to keep her energy up. She and Steven are both big advocates for hydrating before a ride to make sure you feel and do your best. While You Ride Steph finds that the best way to fight feelings of fatigue mid-ride is to focus on your breath. She explained that if your legs are killing you mid-ride a good time to give them a break is during arm exercises. This gives your legs the rest they need and allows you to focus on your core while sitting up properly. Recovery In addition to eating healthy snacks for energy boosts, you’ll also want to increase your protein intake around long workouts in order to speed up muscle repair. Follow your ride with some lean meat or fish to get those muscles back in shape! Long Term While these tips will help you get through one ride, the best way to support your cycling habit is to infuse healthy carbohydrates and proteins into your daily meal choices. A good goal is to aim for one fist-sized serving of slow-acting carbohydrates (whole grains or fruits) at every meal. A higher protein and iron diet will also leave you feeling less fatigued throughout the day. The right snacks and meal choices can truly make or break your ride, so when you’re checking out all the options, look for those that are high in carbohydrates and grab a sports drink to wash them down. 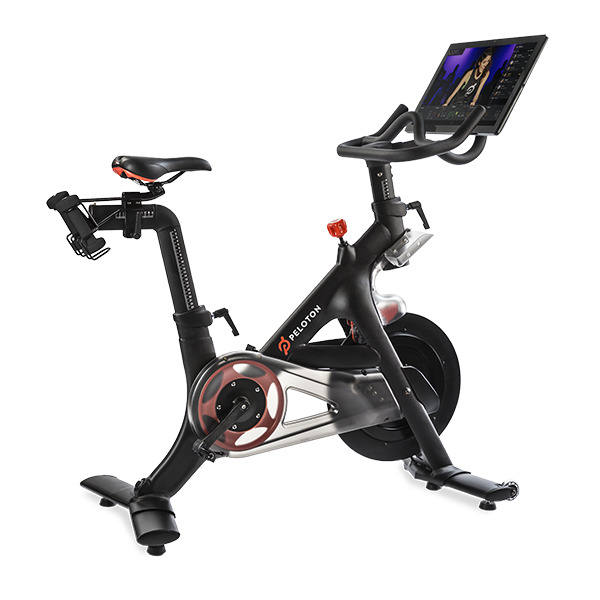 Peloton offers over ninety 60-minute rides, seven 75-minute rides and one 90-minute ride (for all you overachievers) so use these tips to help make sure you are going strong through the last minute! Want more? Filter through the on-demand library to search for rides by length. We’ve added a fresh face to our dynamic roster of coaches. Meet our newest addition: Steven Little! If you’re joining us in the studio, book your spot for a ride with Steven through our online schedule: www.pelotoncycle.com/schedule.